For those that would prefer to take home some excellent table fare, rather than a set of antlers, High Adventure Ranch offers Cow Elk Hunts – which we routinely discounted as part of our herd management program. Cow Elks still provide an exciting hunt, and the flavorful and healthy red meat, that is high in protein and low in fat, is rapidly growing in popularity. 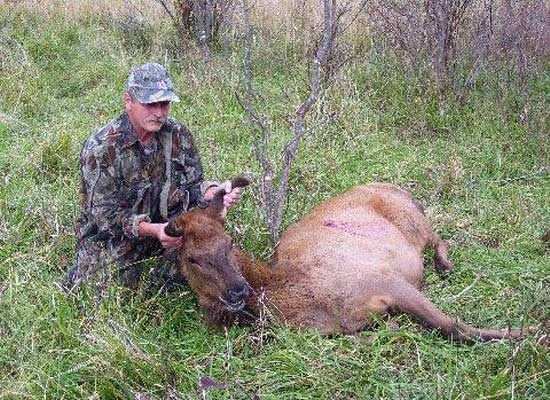 Cow Elk hunts are perfect for our trophy hunter’s family members who are looking for a less expensive animal to hunt. I stayed at your ranch last November and my wife and I were treated like royalty. I harvested a 450 lb Cow Elk and took lots of packaged meat back home, and frankly, had the time of my life! Thanks to all. I have been flashing my photos and bragging to everyone ever since. P.S. It’s great to be a customer, and even greater to be treated as one.